Console room - here I come! 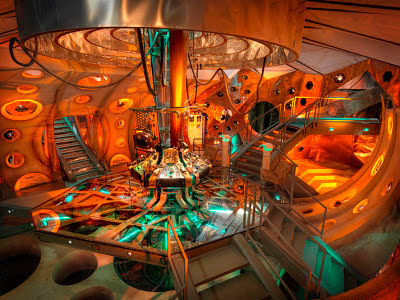 As you may haver read in my blog, I booked my tickets for the Official Doctor Who Convention taking place in Cardiff in late March. 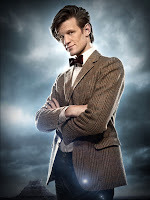 Now, I was none too impressed with their charging structure, so had to book for both days so I could get my photo taken with Matt Smith, as well as get his autograph. 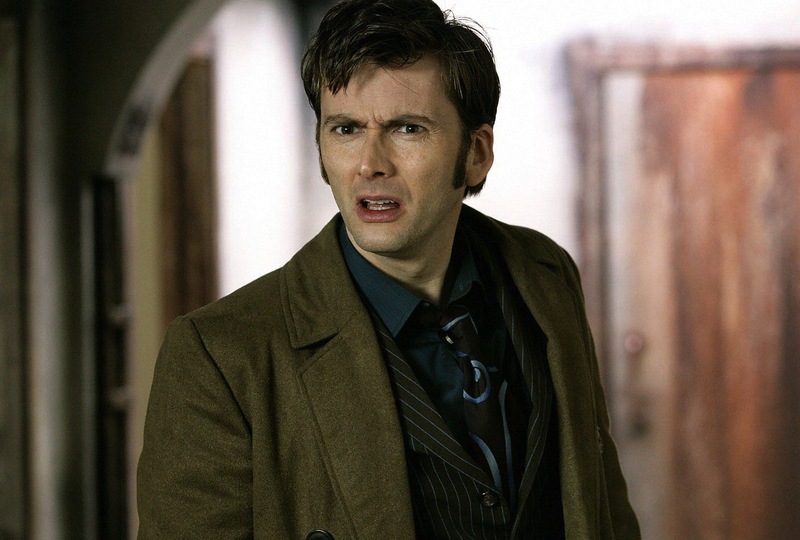 The organisers did see the error of their ways (partly) and refunded those who book for Steven Moffat’s photo and autograph, changing the policy on the add-ons. We this morning I had an email in my inbox announcing a further add-on - this time for free - and something WORTH having! 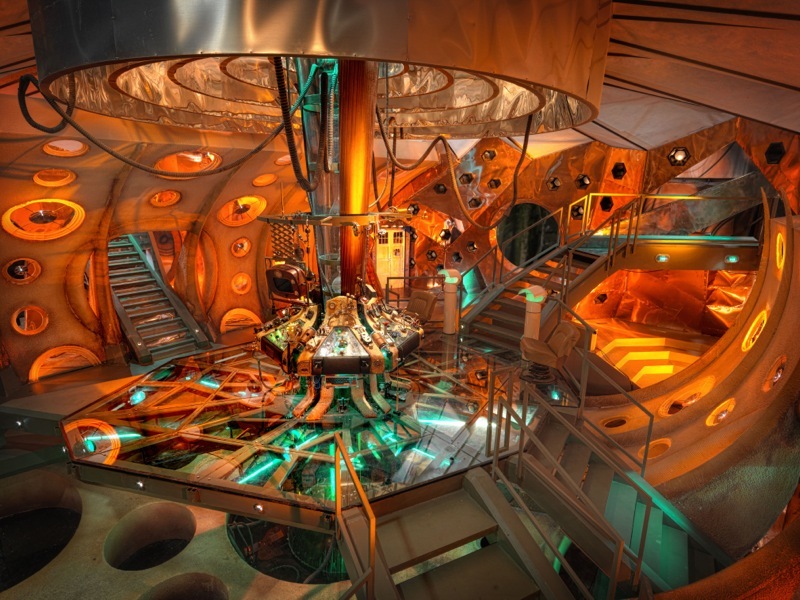 A FREE TOUR OF THE TARDIS CONSOLE ROOM SET AT THE UPPER BOAT STUDIOS! And Who wouldn’t want to see that!!?? They even give you a complimentary bus between the convention venue and the studios, departing hourly, with ten tours on each day, plus some on the Monday after the event too. Over the three or so years I have been writing my blogs and sharing my experiences making my costumes, I have from time to time received messages from readers who have been inspired to pick up a needle and thread and sew for themselves. Some have followed the instructions I have written; others have simply been incentivised to start a pipe-dream project they had been putting off. Well this week I had an email from a reader showing me their Matt Smith and David Tennant creations made for their 4 year old son, telling me it was all down to my blog! I was amazed. These little costumes are very well observed, executed and fit real well (with a little growing room). I had to find out more. After a couple of emails I now have the background story to the costumes, so for the first time I’m gonna hand over my blog to one of my reader to tell you more. This was my first attempt at making clothing of any kind. 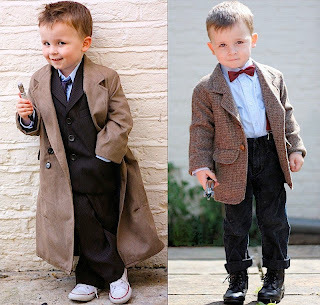 For many years I had been making soft furnishings for my own home and various other crafty projects, but a small boy with a Doctor Who obsession dictated that I should give costume making a go. Research proved that ready-to-buy outfits were not going to cut the mustard and buying the correct fabric by the metre was not a viable option for play costumes that would be grown out of in a year. 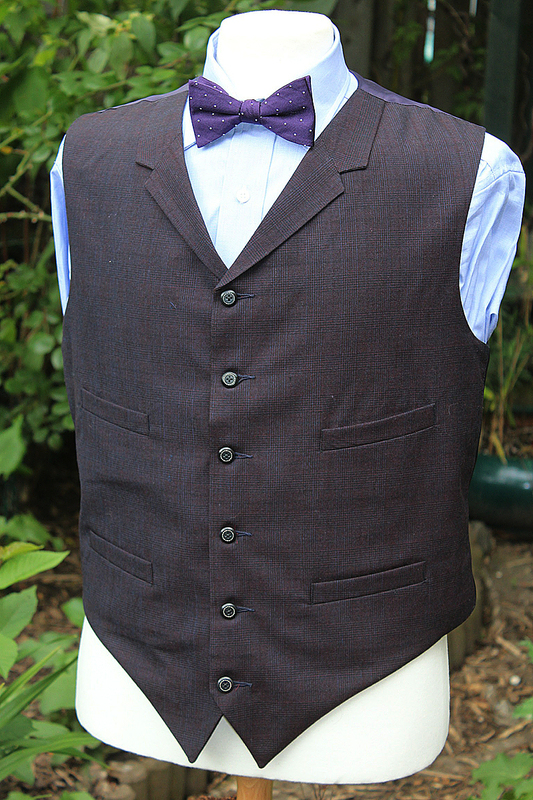 Finding this website, I followed advice on searching eBay, found a few child sized jackets, but they were either not the right styling or the incorrect colour, nothing was quite right. 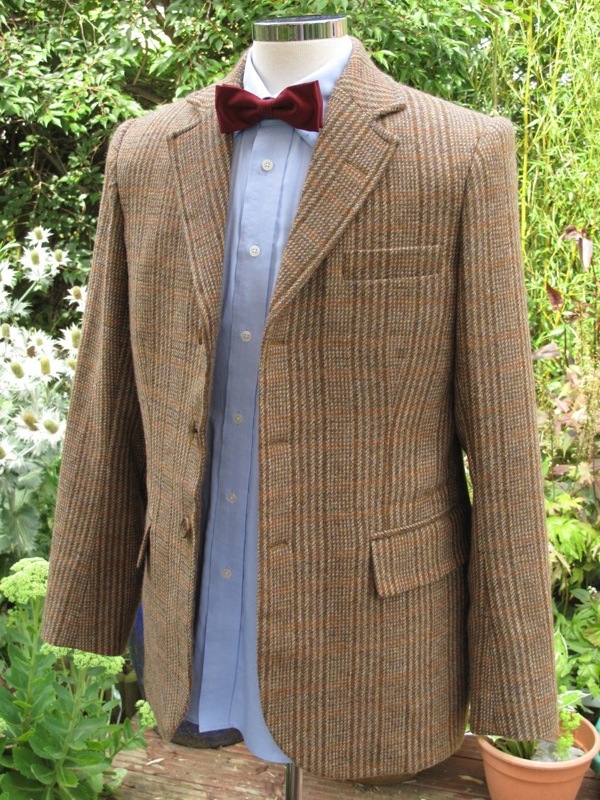 So, I decided to trawl charity shops looking only for ANY jacket that was the right or similar tweed. 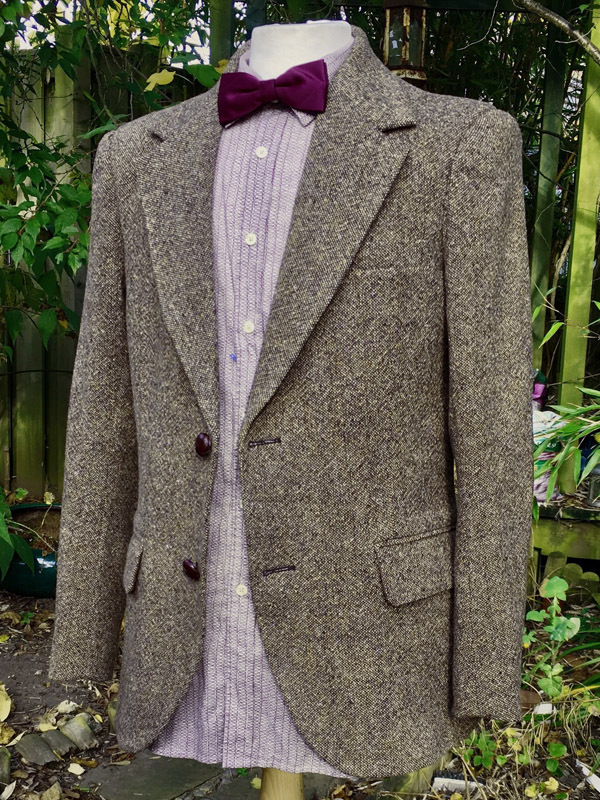 A 42" jacket was found in the closest I’d seen to the Harris tweed... now the challenge of making it fit a smaller than average 3 year old! 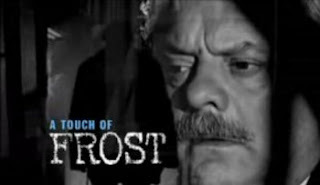 So, I’m mindlessly watching ITV3 this week, just to unwind after a long day’s tailoring, and guess what I spotted? In one of the seemingly endless re-runs of David Jason in A Touch Of Frost, I sat up to attention when I noticed the trilby hat he was wearing was made from none other than the Matt Smith Shetland Tweed! Now it is fractionally different, in that it has a single orange vertical stripe in the pattern – but otherwise its spot on! The episode was Private Lives, and dated from 1999. It also had Maureen O’Brien (Vicky from the William Hartnell era) in a small role. I wonder if this is a slightly early version of the weave? I’ll have to ask next time I’m at W Bill. 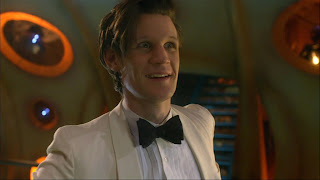 Series Five of Doctor Who saw Matt Smith wear a number of off-the-peg items, which proved to be a double-edged sword. Although most were found, by the time they were identified they were sold out or last seasons lines. 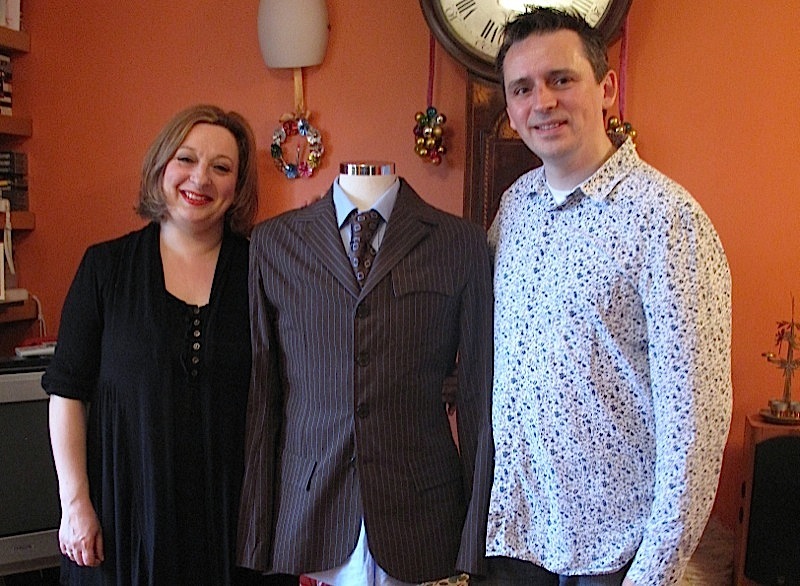 The most sought after was the shirt by Paul Smith, which exchanged hands on eBay for up to £350 on occasions! Series Six saw a whole new wardrobe, and a whole new set of challenges for the average cosplayer wanting to dress as The Doctor. Most of the new costume was custom made, with the exception of the G-Star RAW trousers. The one other thing you would have thought would have been found was the shirts - but no luck there. However, there are a number of sites which offer custom-made shirts to order where you can get a 90% accurate shirt at a bargain price, if you select the right options. Some can even pass for the real thing if you order it right! Here are three sites I would recommend. For the final day of The Twelve Regenerations Of Christmas I have something rather special. It’s just a photo – but it’s a very special one. And yes, it really IS Louise Page, costume designer for the Tennant era and the creator of his iconic look. 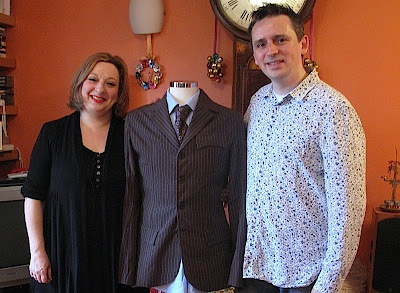 Watch out over on the Tennant Suit blog for the back story to how this photograph came about. Today on the Twelve Regenerations Of Christmas I have another eCard for you. This one cracks me up! Hope you enjoy it too. 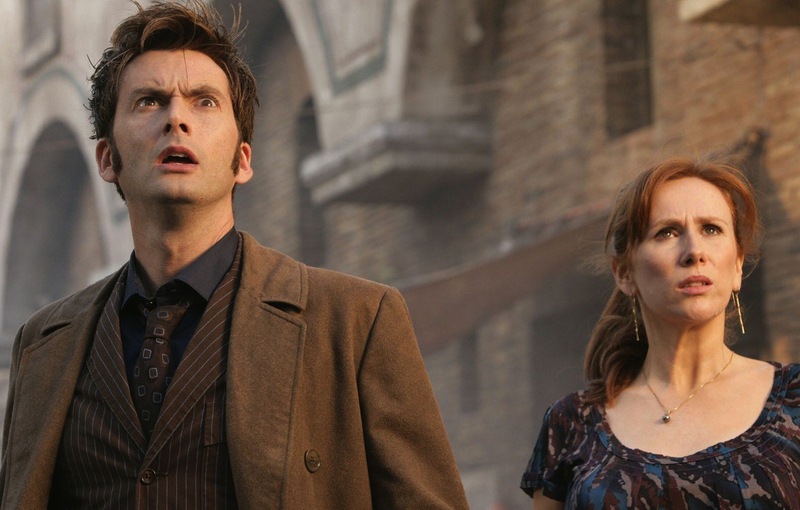 Since it is day TEN of my Twelve Regenerations Of Christmas, I have something TENTH Doctor related. 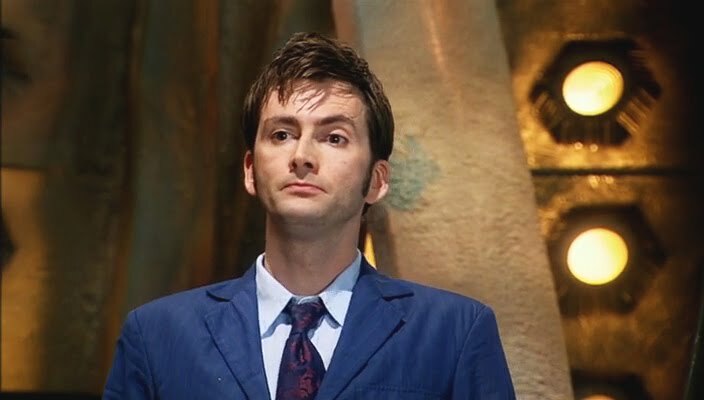 My most popular entry, the Tie Index, sets out to document the ties worn by David Tennant. I’ve spent a long time researching it and done my best to make it as complete and accurate as possible. Fans have their favourite Tennant ties, such as Tie Four, The Swirly Christian Lacroix tie (see above); or Tie Seven, the Giorgio Armani (see left). These were used in four and eleven episodes respectively. 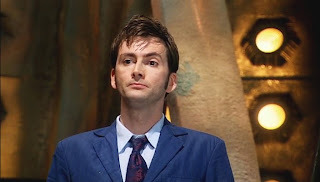 But a tie that is overlooked is Tie Nine (see below), which appears in a respectable ten episodes. I’ve been searching for this one for a while with no luck. But then a few weeks back one of my readers sent me an email out of the blue with the info I needed – and this comes from a reliable source! Trust me. I can now reveal its label is Kenzo. Today on the Twelve Regenerations Of Christmas I have a look back in time to 1978 and how the Doctor Who production crew celebrated the festive season. In the 1970s, before the rise of It’ll Be Alright On The Night, the technicians of the BBC’s VT department would collect together all the comedic outtakes from the corporation’s output over the year. These were then compiled and shown at the Christmas party to a select audience. As time went by special scenes were shot for specific inclusion in the tape, and in 1978 Doctor Who made its contribution. 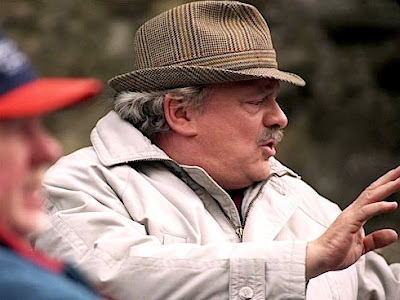 It was while recording The Armageddon Factor that Tom Baker, Mary Tamm and John Leeson filmed a brief improvised scene dubbed Doug Who? Its a little risqué, with The Doctor and Romana apparently sharing an off-screen kiss before plying K-9 with vodka! The tape did the rounds under the table for many years, until it was included under the title Merry Christmas Doctor Who on the final disc of the Key to Time DVD set released in 2007. K-9’s Christmas wish for fewer sill irons is a reference to discreet metal bars which braced the bottoms of doorways on sets so they don’t drift apart. These would cause endless problems for K-9 as he couldn’t get over them when entering and exiting scenes. I have also found one other BBC Christmas Tape which contains a Dalek patrolling the corridors and back rooms of BBC tv Centre. I can’t see this one ending up on a DVD just yet though . . . . .
It’s day EIGHT on the Twelve Regenerations Of Christmas, so I have eight drawings to show you today. 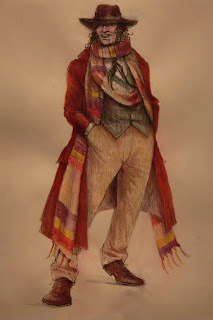 I thought I’d take a look back at the surviving designs for The Doctor’s costumes. 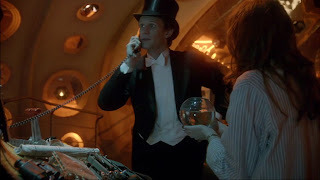 The earliest Doctors were dressed as Edwardian gentlemen, and given the haphazard way parts of the series came together in the 1960s, it is unlikely a formalised drawn design was produced. If they were, they haven’t survived. Jon Pertwee’s iconic Inverness Cape was allegedly his father’s, so it was Jon himself who provided the look of his Doctor. The earliest costume design I could track down was by James Acheson. He had already created some of the most memorable costumes from the Jon Pertwee era, and it fell to him to crete a new look for a new Doctor in 1974. You can hear his recollections of it on The Mutants DVD. He explained how the scarf’s length came about by accident and how later designers put Tom in longer coats, so I don’t think this is the original design. Either way it’s a nice drawing. 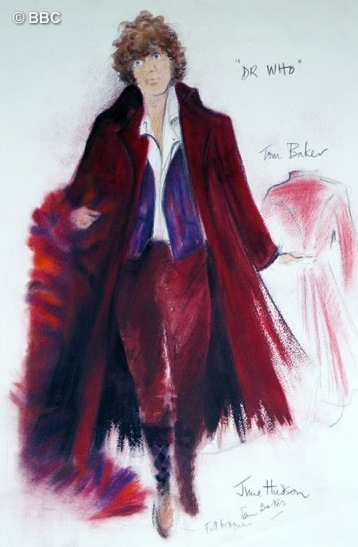 With a change of producer (John Nathan-Turner) a notable change of look enveloped the series, and it was down to legendary designer June Hudson to re-imagine Tom’s costume. She was inspired by a Russian military greatcoat, long and flowing; added knee-length knickerbockers and a looser feel around the neck with an open top shirt. And all in a co-ordinated plum colour. June’s designs are always a joy to look at, and this is no exception. Today on the Twelve Regenerations Of Christmas I have a supplement to my popular Costume Index. 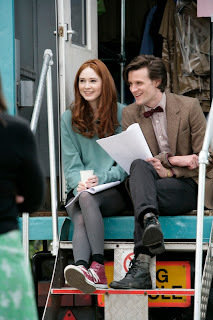 Series Six may have finished, but we already have had a number of DVD exclusive mini episodes. 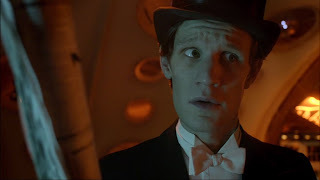 These night time between adventure tales kicks off with The Doctor arriving back in the TARDIS wearing his top hat and tales, previously seen in The Big Bang and Let’s Kill Hitler. 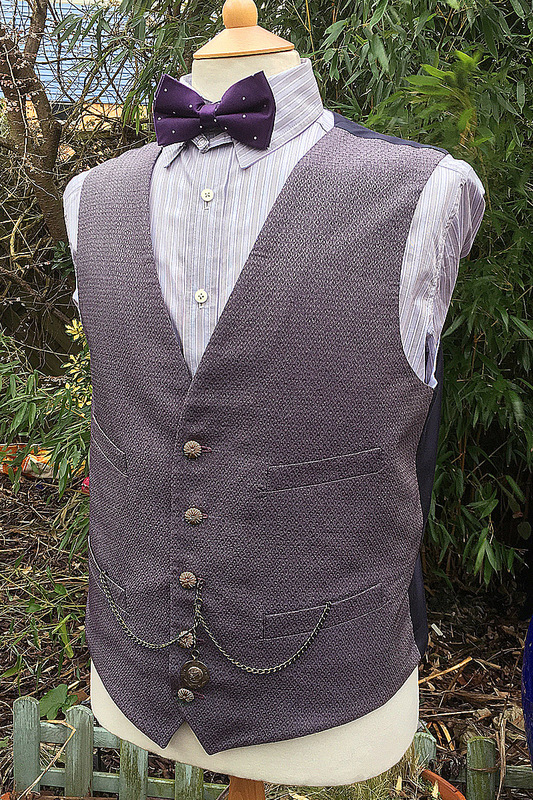 The costume recently sold at a Bonhams Auction for £2,625. 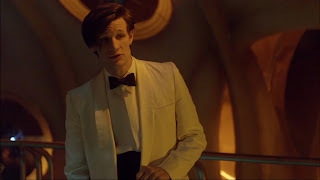 For the next part, The Doctor wears his white tuxedo, previously worn for the Hollywood pool party scene in A Christmas Carol. 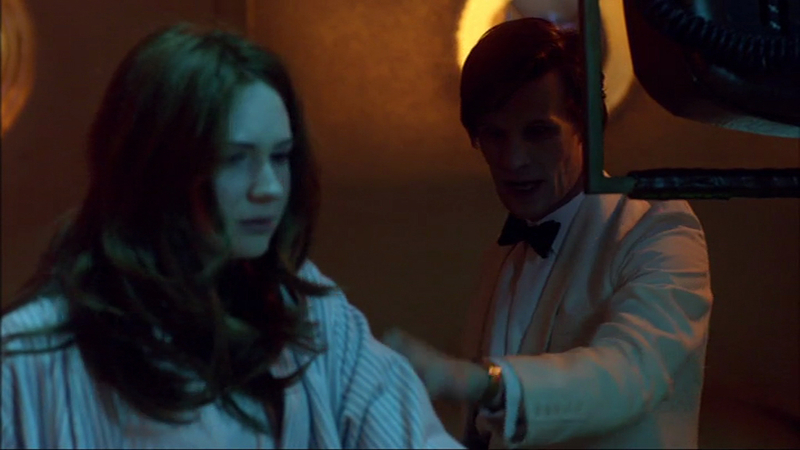 We do get an interesting glimpse of the jacket’s cuffs, which show it has an uncommon five button vent (see left). The final two parts form one story, with The Doctor continuing to wear the white pool party tuxedo. 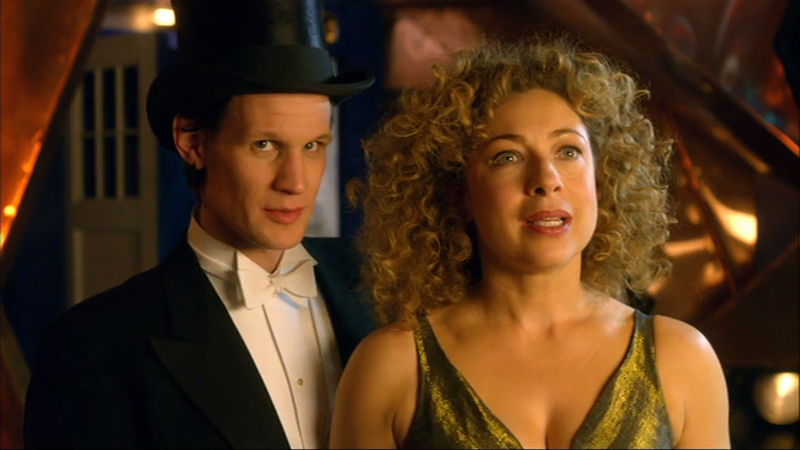 At the end of part four, an alternate timeline Doctor and River arrive, with The Doctor in his top hat and tails again.